I would be forever grateful if you could nominate So Many Lovely Things for the Cosmopolitan Blog Awards 2015 under the Best Beauty Blog (ambitious, I know). Don’t get me wrong, I absolutely love the followers, the comments, the interaction with people who share the same love as me, the fabulous brands that believe in me and in what I do. And oh, the unique ability to inspire, even if one person out there, and to perhaps give them a little nudge to enhance their amazing selves… it is truly priceless. But my blogging has a more selfish reason to be: me. My passion for beauty, style, fashion – and shoes – that is so huge that leaks out from my small person into these virtual pages. Most importantly, it has given me comfort when I needed the most. I never thought that, in claiming my little corner of the internet, I would be exposed to so many amazing things. It has given me the chance to work with amazing brands, it has exposed me to a wealth of knowledge which is ever growing, backing up my love for the subjects. And the people… I met amazing people. I feel extremely lucky, privileged and humbled. Oh, and eternally grateful. However, I take an award wouldn’t go amiss, right? 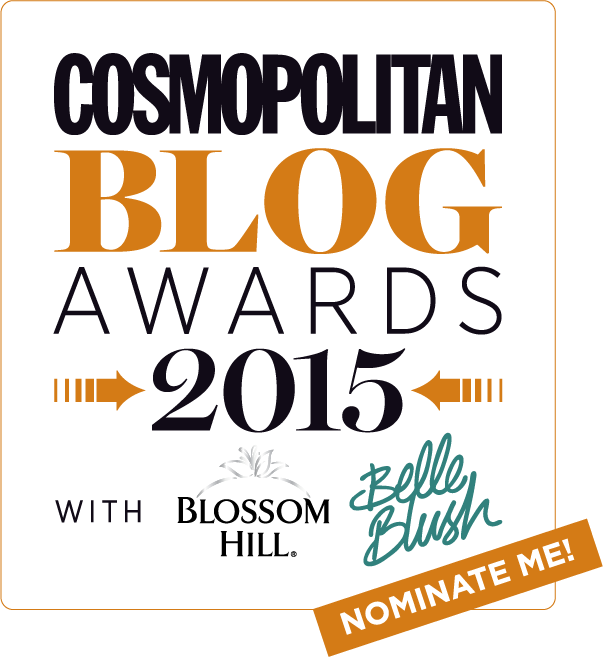 So please (I say again, just in case) nominate me for the Cosmopolitan Blog Awards 2015 in the Best for Beauty category. It’s super quick, and you can do it by filling the form on their page. You never know, I might even get shortlisted! Should I be, there will be a little post asking you (yes, I always ask too much) to vote for me. And thank you. Not just for this, but for being here. There’s a lot of love going round.